Wars mobilise people. Whilst armies march, offensives are met with counter-offensives. Hostilities, violence and fear spread like an epidemic causing ordinary civilians to flee. Quickly, entire nations fluidly move to adjoining countries and the path of history and ancestry are changed forever. This is what occurred after the Molotov Ribbentrop agreement took effect and both Russia and Germany invaded Poland. Whereas Hitler had condemned people based on their racial background, Stalin condemned them on their social criteria. And thus, Stalin commenced moving a large proportion of an entire nation from their homeland in the Kresy region of Poland to Siberia and Kazakhstan. Although the term "deportation" is widely used, deportation was really for the realm of the criminal. What crime had the Poles committed to deserve this? Being Polish? Really, this was "ethnic cleansing", Stalin was clearing the Poland of Poles, under various guises, but ultimately ethnic cleansing was the correct term to use for his actions. However, "deportation" is widely used and for the purposes of continuity we will use this term herein. This video covers the 1939 Russian invasion of Poland, the initial confusion on the poles part as to what was going on and then onto the deportations. As you watch the video picture this happening to you and your friends. Very moving. 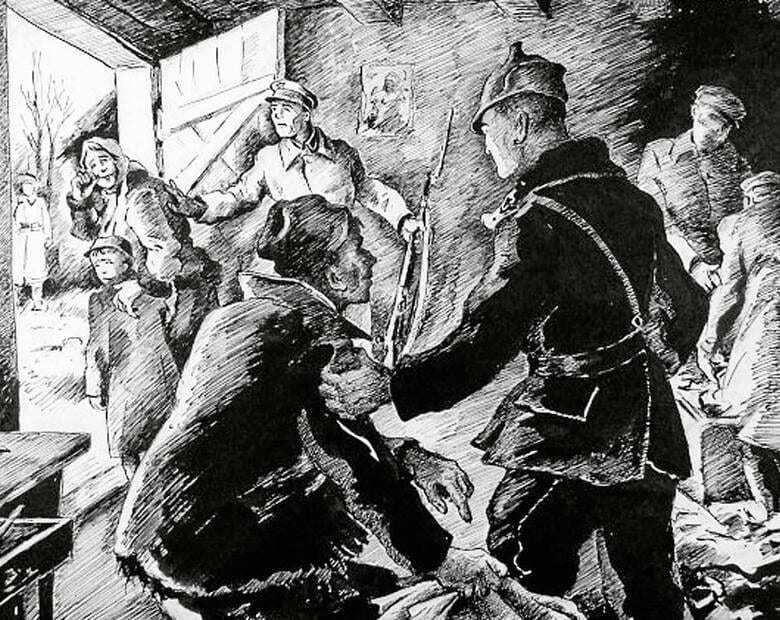 To undertake a deportation, the NKVD adopted the approach of knocking urgently on their door in the middle of the night. Repeated urgent knocks would follow, with urgent shouts to hurry up and open the door. Russian soldiers with bayonets would burst in shouting "hands up" and would force the entire family, including children up against a wall whilst all were searched for weapons. The house itself would then be searched for weapons. The Polish citizens, having been subjected to sudden fear and in many cases violence, particularly the husband being struck with the bayonet as a form of gaining control and suppression, would then be in a highly emotive state, often crying uncontrollably. They were given a short amount of time to get some belongings together (many took barrels of salted meat, photo albums, foodstuffs and winter clothes). Normally, at this point, the news of the families arrest would spread like wildfire around the village. A short ride normally on a sleigh or horse and cart (where the cart was often a re-purposed dung cart) would then take the family to the railway siding. Villagers would often follow, crying, bidding farewell knowing they were unlikely to ever see their neighbours again. The above section was the typical scenario for those in wave 4 of the deportations. Waves 1 to 3 were slightly less different in that a pretence of legal proceedings was carried out often against a single person in the household, for instance that they were an "Osadnik" (i.e had fought for Poland previously and had been given Polish land as a gesture). Wave 4 deportations were generally speaking, the riddance from Poland of anyone connected in anyway to those deported in waves 1 to 3. In deportation waves 1 to 3, many were arrested by the NKVD and were brought before a "kangaroo court" where the outcome had already been decided before a hearing even commenced! The proceedings themselves were often as little as 3 minutes long, the accused had no fair trial or ability to defend themselves. The bewildered polish citizen was then accused of an imaginary offence such as sabotage, spying or even just "defamation of the soviet union" and within mere minutes was found guilty and sentenced for 10, 15, 20 and even 25 years of hard labour. The term "deportation" was used, as if, in some way, these people had committed a crime. The crime? Being Polish. This was not "deportation" but rather the mass forced removal of Polish citizens from their homeland and onward towards imprisonment within hard labour camps where the ultimate jailor was the climate of Siberia itself. 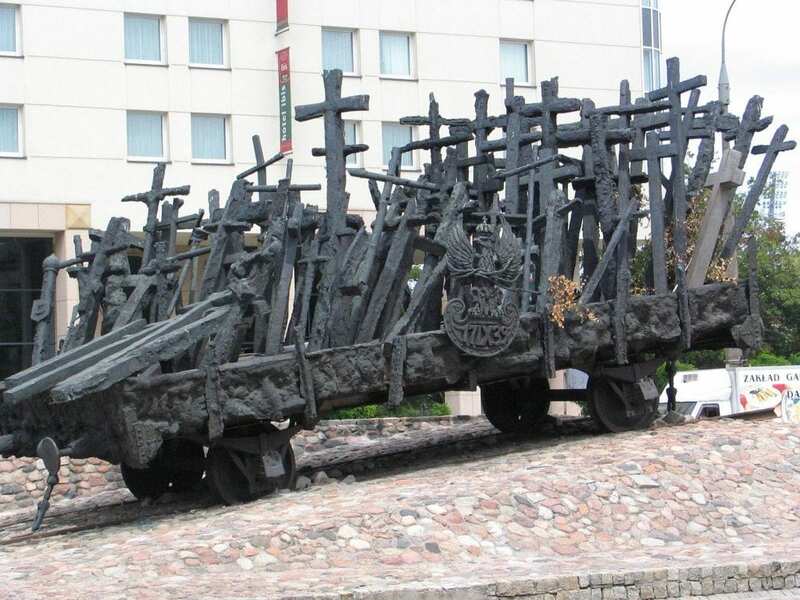 A better description of these trains would be "Genocide Trains" because the purpose of them was to rid Poland of Poles with the Gulags, their ultimate destination, reducing their life expectancy to a single year. "Genocide", the deliberate mass killing of an ethnicity, is a much better description than deportation, but for now we will stick with "deportation trains" as that is the commonly known (and sadly, commonly accepted) phrase used for this poignant point in history. 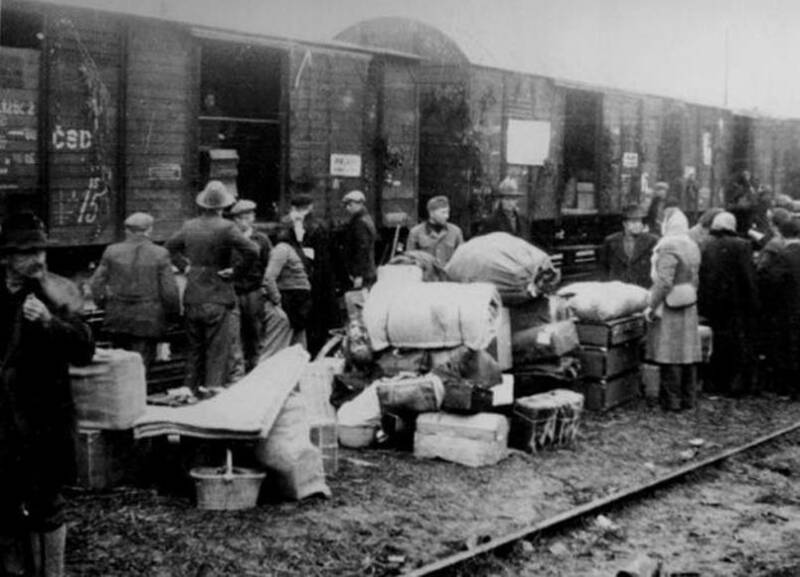 Polish deportees being forcefully boarded onto a "deportation train" to Siberia. 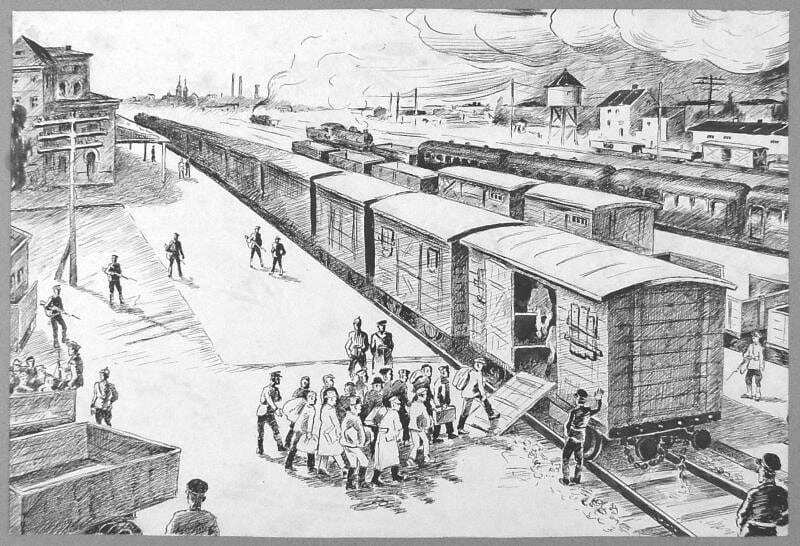 The railway carriages that the innocent polish people were loaded into were "cattle wagons". As many as 70 were brutally bundled into a cattle wagon that could comfortably take 20. There was no privacy. Most accounts from survivors mention them cutting a hole in the floor through which they had toilet facilities. Some survivor accounts mention women being unable to undergo this level of indecency and literally dying from burst bladders. Other accounts mention people ceasing to feel human or even caring as natural body functions took over. The stench was unbearable as men, women and even children performed bodily functions in front of everyone. 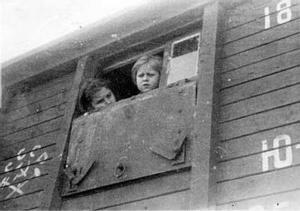 Some survivor accounts mention that they were locked in the railway carriage and left in the siding for up to 3 weeks before the journey even began. Lack of food, water and extreme temperatures caused some to die in the overfilled carriages. Dead bodies were tossed out, unable to have a decent burial. 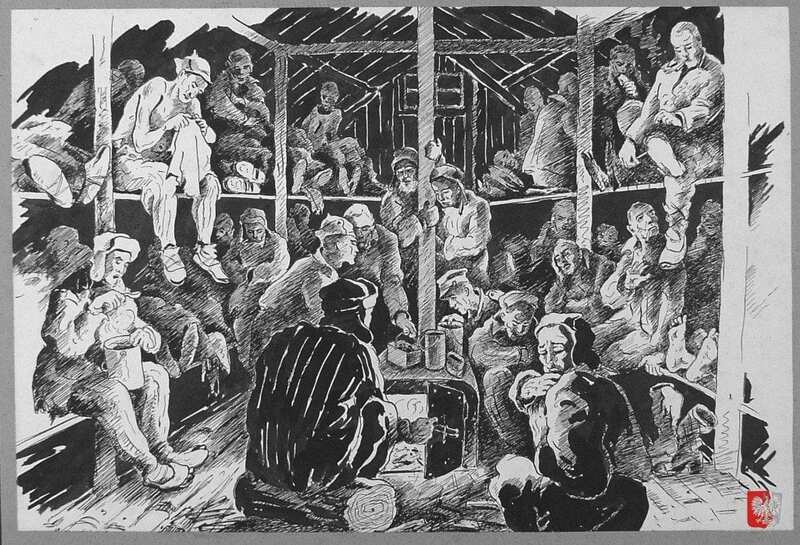 An artists depiction of the inside of one the cattle carriages carrying deported poles to the Soviet Gulags. This picture seems to show rather much more space than survivor accounts recall. Polish military settlers, policemen and foresters. Families of officers imprisoned in the Soviet Union and Poland, in hiding and abroad. Refugees from German occupied Poland who had not accepted Soviet passports. Polish citizens from the Baltic states and those missed in earlier deportations. The journey to the Soviet Gulags took a staggering 3 to 6 weeks depending how far away your destination gulag was. Many died along the way from exhaustion, lack of food, water or heat. Although accounts mention wood burning stoves being in some cattle trucks, no wood was given to them so they had to hurriedly scurry around whenever the train stopped and quickly locate piece of wood which would give a little heat for a short period. Those who packed kettles and pots were able to scoop up fresh snow when the train stopped and thus use it for washing or boiling a kettle on the stove in the cattle carriage. However this came at a price. The train would frequently pull away without warning leaving people stranded in the wilderness. Did they live or die? We will never know. The trains travelled in extreme cold temperatures, hands would get stuck to the side of trains and ripping skin off was a real hazard. Even hair would get frozen to the side of trains if blown against it. The Russians at railway stations were sympathetic to the plight of the deportees and would attempt to discreetly help them. However they had to be careful for this could get them into serious trouble with the authorities. 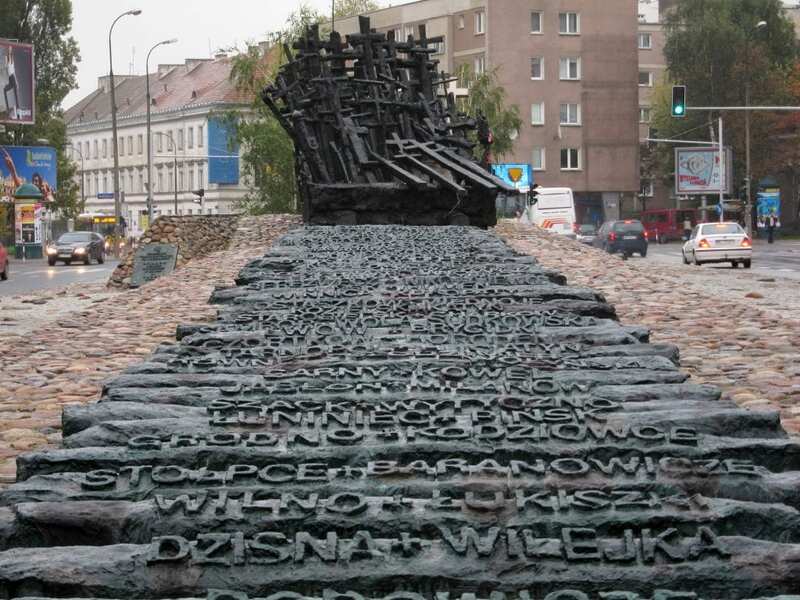 Unveiled on 17 September 1995, this monument in Warsaw commemorates the victims of the soviet invasion of 1939.